Teeth whitening never crossed my mind when I was 17. I was complacent, I was proud and I was confident with my SUPER white teeth. They were SO white, that I had people actually asking me what my secret was when I was in High School - though there really wasn't any. Fast forward 9 years later, after 4 years of braces (okay I'm lazy to wear my retainers now and that's why my teeth are messy again! *cries*), and lots of coffee in LaSalle later.. BOOM. Yellow gross teeth. YELLOW. Like literally the color of my skin yellow; it's very very depressing... You don't know how depressing it is till you've got it, really. And you're probably thinking my case is not that bad and I'm probably exaggerating BUT! Just scroll down and be amazed. THANK MY LUCKY STARS THOUGH because I got this amazing sponsorship from Lush Aesthetics and I was like YESSSSS!!!! A new way to fix my teeth before Chinese New Year comes around! Plus all you readers who would like to get YOUR teeth fixed, no worries, there's a HUGE promotion at the end! Wow, what is there to say about Lush Aesthetics - how about, A LOT!? Their aesthetic technologies have been featured in the news and their treatments have been featured in many magazines such as Bazaar, Simply Her, Cleo, and many more! They have quite a few of Testimonials (Click HERE to read), and it's reassuring to see a sea of good reviews about them on the internet as well. They carry out a plethora of treatments from Fat Freezing, Lip Laser, Liposonic, LED Teeth Whitening, Hydrafacials, Facial lasers, so on! You will be astounded by just how much they do! Whatever issue you face with your looks, they've got you covered. Since our teeth suffer discolorations from many things (mine being coffee, argh! 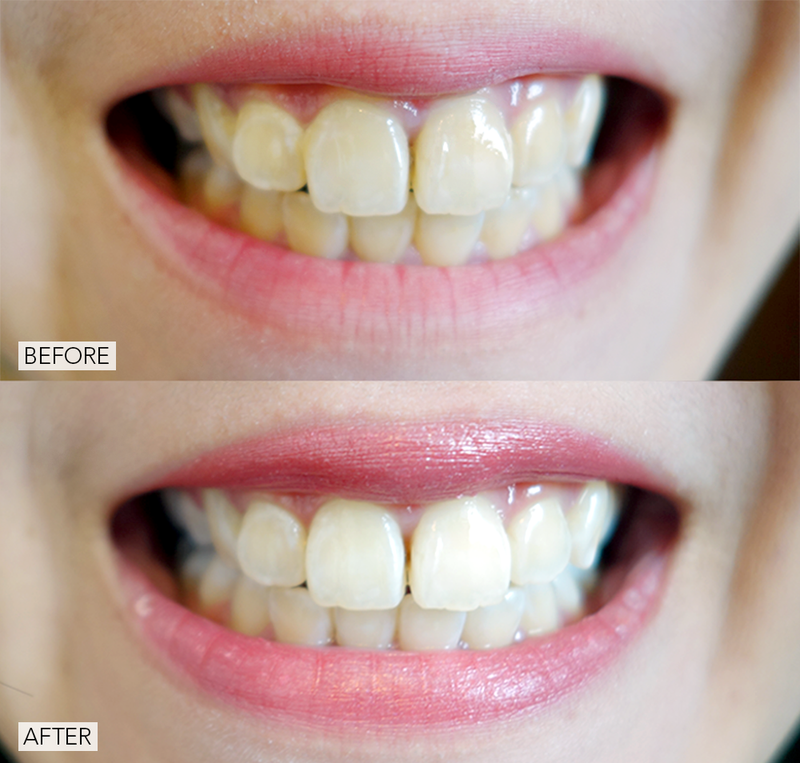 ), this LED Teeth Whitening brightens and lightens the teeth dramatically in LESS THAN AN HOUR! 99% of their customers have achieved 5-8 shades lighter as can be seen above. 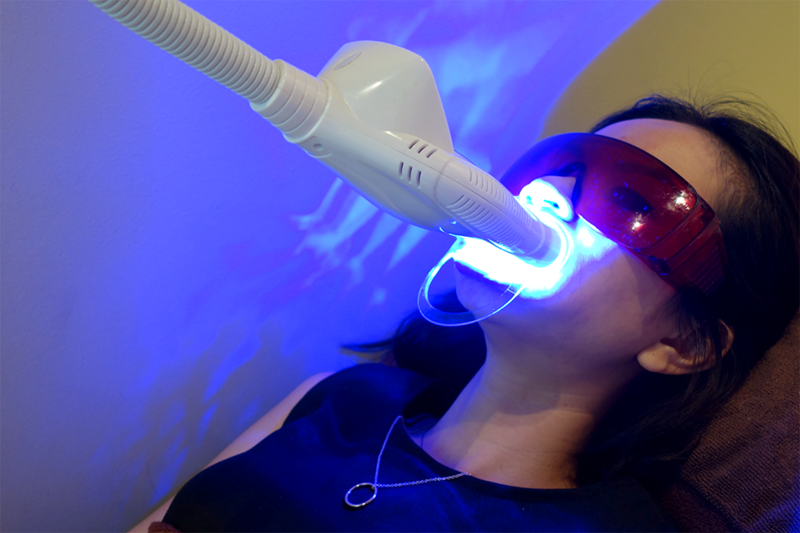 The best part is that this LED Teeth Whitening System is suitable for people with sensitive teeth - it is safe and effective with no damage to teeth enamel or structure! Woot! The results can also last for years depending on lifestyle habits; so smokers need to try on cut down on or quit smoking, and coffee drinkers A.K.A me need to lessen the addiction as well haha. So I entered LUSH Aesthetics and this is what greeted me! 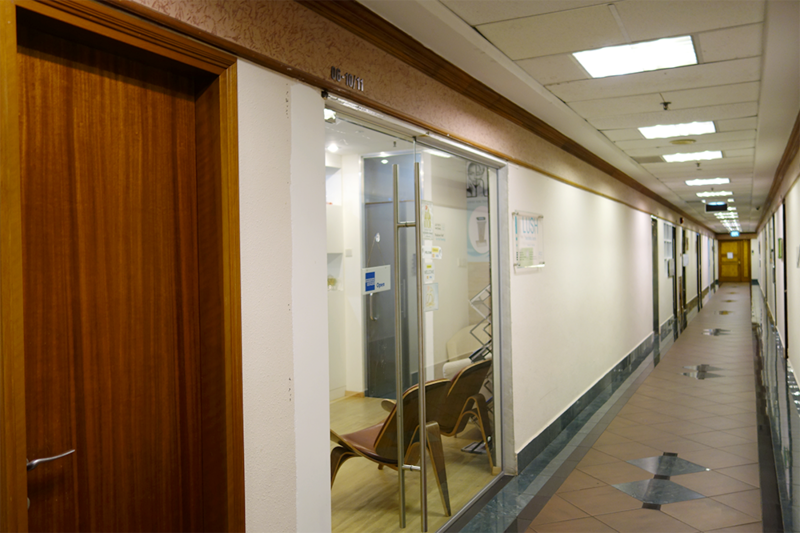 A very very clean waiting area with a good view of the treatment rooms. I went through the usual registration process, and was later brought into a room to by my consultant, Mika to inspect the condition of my teeth. Mika showed me the range of teeth colors from white to... brown lol, and as you can see from the photo background that mine was the 4th worst. I TOLD YOU IT'S BAD! 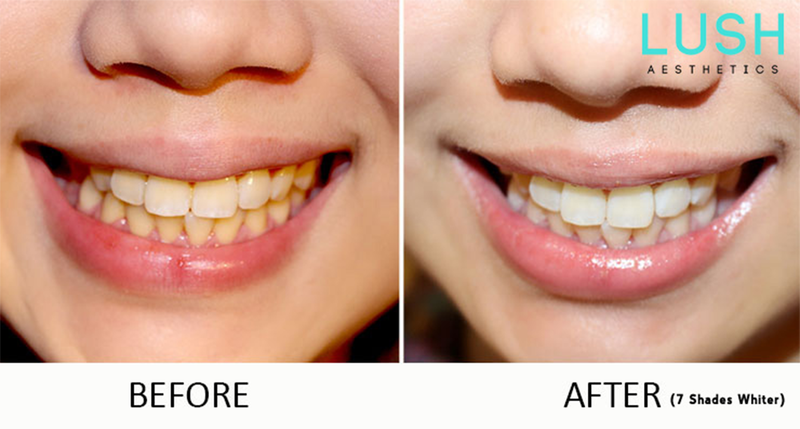 She explained that the reason that mine was at such a stage was very very likely due to me not having done whitening/polishing after having my braces removed. (EVERYONE, PLEASE REMEMBER TO DO SO AND NOT BE LIKE ME!) She also pointed out the other obvious factors like coffee.. curry... and carbonated drinks because they contain carbon which causes yellowing of teeth! I was then taken to a treatment room where the process would be carried out. Whilst Mika said there would be no pain itself during the teeth whitening, I might experience a little bit of discomfort. Some people have been said to have slight ulcers (worst case scenario) due to the opening of the mouth for so long, which you'll see later. As you can see, the room has a tiny sink area where I was asked to gargle my mouth first before beginning. Thereafter, my mouth/lips were prised open with this plastic contraption. Yes, it looks HIGHLY unphotogenic, but we all have to suffer to look good right? Haha. It was also HIGHLY uncomfortable at first though I eventually got used to the sensation. The only problem was that my lips would get incredibly dry and slightly painful DESPITE them putting on lip balm at the start for me. So if you're like me and get very dry lips, remember to tell them to add more lip balm for you! The blue gel was added as a protectant to my gums before whitening. Though the blue gel is injected onto (not into!) the gums as a liquid at first, it actually solidifies later. The whitening gel, which acts as a 'target board' for the LED light to focus on, was later added onto my teeth.I was also given goggles to prevent getting my eyes hurt from the LED light which could be very bright. When that was all said and done, the light was then lowered onto my teeth area and I was told to rest and wait for 20 minutes. I was to go through 2 rounds of 20 minutes, so they would check in before my second round to ensure everything was going smoothly and that I was comfortable before going on. I was also given a bell to ring if I needed anything! Very attentive indeed. After I was all done, they showed me my before and after on the scale again and I was SOOOO HAPPY! I went down 14 shades from S34 to S20!!!!!!!!!!!!! I literally wanted to SQUEAL out loud but I was afraid of looking weird hahaha. Mika told me that for me to really reach a shade I desire which would be closer to white than yellow.. would take me about 4 sessions in total. Also, I was informed not to take ANY COLORED LIQUIDS for the next three days. This means no chili sauce, ketchup, milo, coffee, cheese fries (lol), etc. It may seem like a burden.. but no pain means no gain! First off, sorry that the Before photo looks so gross. I know many of you probably thought how bad could it possibly be when you first started reading this post. Obviously, the answer is VERY BAD. Lol. It's really the color of my skin right!!? It makes me cringe so badly inside just looking at this photo. Anyhoo, it's lightened by 14 shades HOORAY but it's still pretty yellow. In fact, in the after photo, you can see it's still slightly yellow so yes - I have a little bit further to go in this teeth whitening journey of mine. Oh yes, and in case you're wondering, I actually clarified with LUSH Aesthetics and they said that I can go for my next treatment in 3 weeks if I felt comfortable enough, and I could also use other whitening agents such as Crest WhiteStrips immediately! :) I am now much more watchful of what I eat and drink and will also plan more visits to the dentist for polishing. Click HERE to get your appointment now! Do try it now at such an affordable price, you definitely won't regret it. Lush Aesthetics can be found at Tanglin Shopping Center #06-11, which is in the middle of Orchard Parade Hotel and St. Regis. I personally took a train down to Orchard and walked, which admittedly is pretty far as I headed down towards the direction of Forum and continued. In total, from Orchard MRT, it took me a little less than half an hour to get there but I didn't mind. If you DO mind, then take a cab to Tanglin Shopping Center (NOT Mall ok!) and the postal code is 247909. There are bus services too which stop nearby, so I'm sure that shouldn't be a hassle. Hi, I'm interested in the led teeth whitening treatment after reading your review. May I know how much does your treatment cost since you're doing the one with carbamide peroxide? my treatment may cost $300+ at first trial as opposed to the usual $188 for the non-peroxide treatment! Hello! 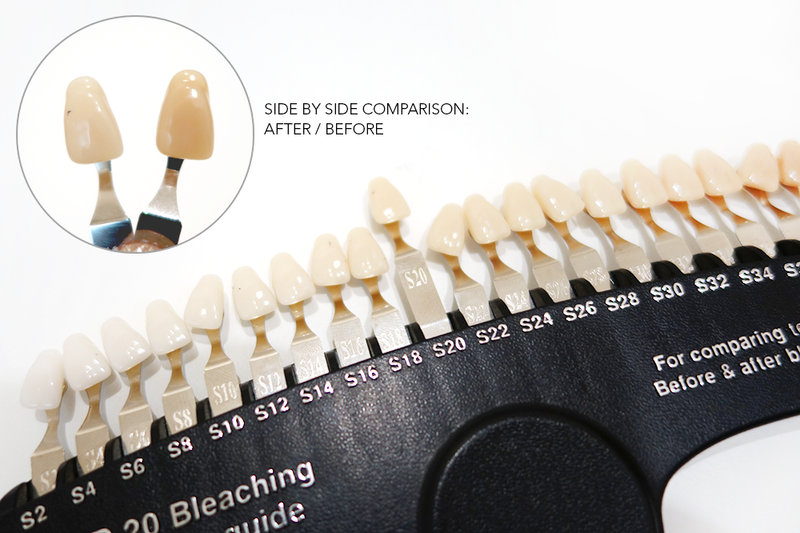 Are your teeth still in the same shade as your after treatment? I tried to maintain by brushing my teeth after drinking coffee or using the crest white strips so I'm actually not too sure if the whitening remained solely because of the LED teeth whitening or because of how much effort I put in haha. But my teeth are still generally much whiter than before and staining is 80% gone. I hope this helps!